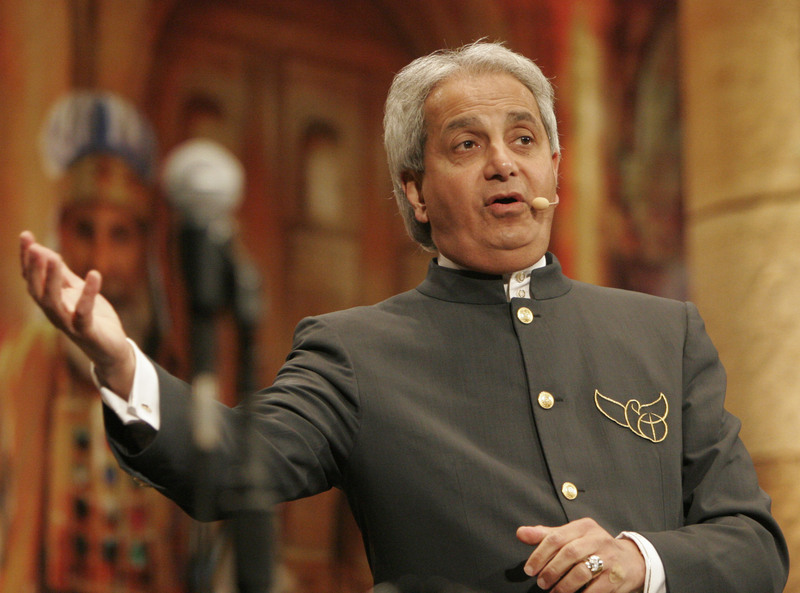 Benny Hinn will return to Trinidad, to preach his LIES at a cost of $600 per person. AMERICAN televangelist Pastor Benny Hinn, one of the few people to ever meet Juliana Pena, the spiritual adviser of former prime minister Patrick Manning, is returning to Trinidad for a three-day “Fire Conference”. And this time, it will cost believers USD 600 for the three-day conference at Miracle Ministries in Chaguanas. The conference is scheduled to begin on February 17. Hinn, on his first visit, predicted Manning, then opposition leader, would become the country’s next prime minister. He also said he cast out more devils in Trinidad than he had done in a long time, attracting criticism from several religious groups. In 2006, during his second visit in May, Hinn met Pena. “Years ago, I was in Trinidad… This man was sitting on the platform and I said…you will be the next prime minister and he is till now. I was in his (Manning) office a few months ago…he brought with him a very foolish woman who called herself a ‘prophetess’,” Hinn said. “He came to the room with this woman and said, ‘I have a gift for you.’ So he looked at me, said, ‘This is the woman; she has a word for you…’ I was not happy and when I am not happy, people will know it. He (Manning) said, ‘I want her to pray for you and give her the word; I take her with me everywhere,’ he said (Manning). “‘God speaks to me through her. She has been a great blessing to the Government. I’m thinking, ‘You foolish man’. This woman reaches out to touch me and I grab her hand in mid air. ‘Don’t touch me,’ I said. Let’s begin with Benny Hinn and his USD 600 3 day conference. Hinn definitely falls under the “peddle the gospel for money.” He captivates his audience with deceit, and the twisting of the Holy Word of God to suit his greedy need. At a cost of USD 600, you risk not only being lied to, but being robbed of your hard earned money. Hinn is an imposter, a fake, who refuses to repent, and continues to spin his lies for dollar signs. It is Only in the Name of Jesus Christ that you can cast out demons, for even they know who Christ is and tremble. People in reality, Christ’s gift of salvation is free. You don’t need to pay even a cent for it. All you have to do is repent from your sins, and accept that Christ died for them, and resurrected. It’s simple, easy, and is eternal. I, for one, would like to meet this woman from Trinidad, because if Benny Hinn doesn’t want her to touch him – that could be a pointer that she might be the real stuff. Benny Hinn for sure is not. He’s a Roman Catholic liar and cheat. You said: Benny Hinn doesn’t want her to touch him – that could be a pointer that she might be the real stuff. My Comment: What does that mean? This woman says she is a “spiritual advisor,” and never once did she claim she cast out demons in the name of Jesus Christ. A spiritual advisor does evil works like witchcraft, and does nothing in the name of Christ, but instead works for the devil. Here are links regarding, Julianna Pena spritual advisor. Here’s another article which claims she is Christian. But again no reference to Jesus Christ. If I’m mistaken, then I owe her an apology. And this link says: Anti-corruption investigators are to seek the assistance of Interpol to locate Reverend Juliana Pena, the spiritual adviser of former Prime Minister Patrick Manning, as they begin an investigation into the construction of a multi-million dollar church at the Heights of Guanapo. Your 100% right on ! We need to pray that the Lord will open his eye’s and let him and other like him see the error’s of there way’s. Benny Hinn is the essence of the Laodicean church, he needs to wake up and smell the coffee and quick, because time is running out FAST!!! God Bless ! What I mean is that Hinn is most certainly no Christian. He is a fraud and thief and a liar. Now, if she is a Christian, that would certainly be a good reason for him not to let her touch him – he’s afraid. I agree he is not Christian. He is a liar, and a false prophet. I believe the point is, when did it cost money to preach about Jesus Christ and his gift of Salvation. About the Benny Hinn article, I don`t agree with you, since Benni does`nt ask money for laying hands on anyone, but the monies are used to facilitate the seating, auditorium renting, and general expenses needed, to accomodate his various conferences. No one supplies chairs, microphones and venues for free! Actually many do offer anyone to come to various conferences for free. If one is able to give, then great. If one is not able, that is ok. Other’s often give more than thier share at Joyce Meyer conferences to cover the cost of the facilities for the one who is not financially able to give. Part of the issue with Hinn is that he is rich and lives a lavish lifestyle. He doesnt have one or two hobbies. He has expensive things that are excessive by any mind. So his financial state should allow him to offer a free seat with the option of giving only the way Joyce Meyer does it. I know there are others, but I cannot think of their names.